A couple of months ago, The Time Bum introduced you to Zelos Watches and their debut model, the Helmsman, a burly dive style watch with sever unique design elements that set it apart from the crowd. 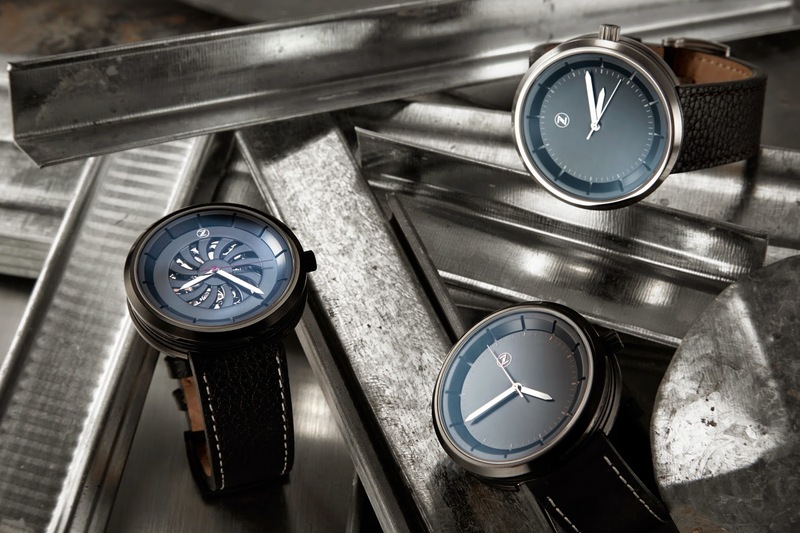 The success of that watch prompted Zelos's founder and designer, Elshan Tang to launch a second timepiece, the Chroma, available for pre order on Kickstarter now. In a departure from the Helmsman, the Chroma is more of an everyday dress watch. 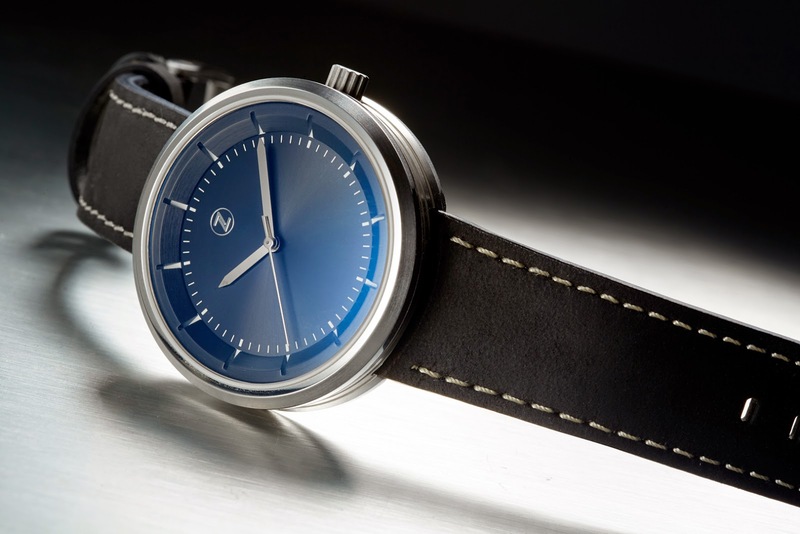 It sports a round, 42x11mm, lug less, stainless steel case that is both brushed and polished. The sides are ringed with a series of smooth, concave channels so in profile, it almost resembles a piston head. The crystal is sapphire with an anti reflective coating. 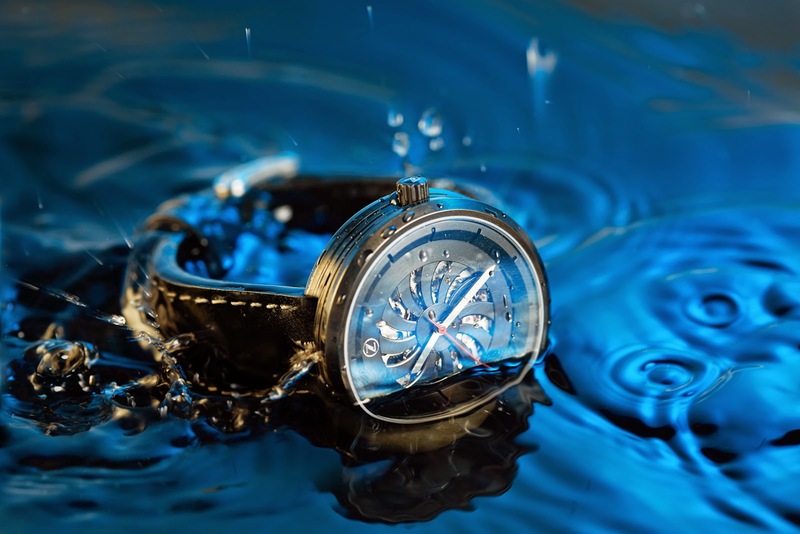 Water resistance is 50 meters. 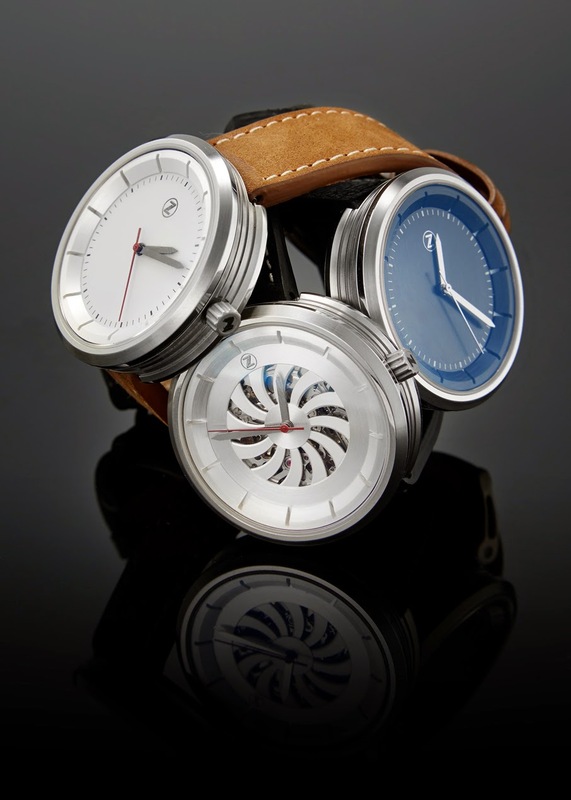 Two models are available: the Chroma and the a Chroma Skeleton. Both feature radial brushing for a sun burst effect, and the hour markers are cut into a ring set over a polished surface. A white index is printed to the inside of this ring. Hands are a polished, pencil style. It is a clean and modern look. 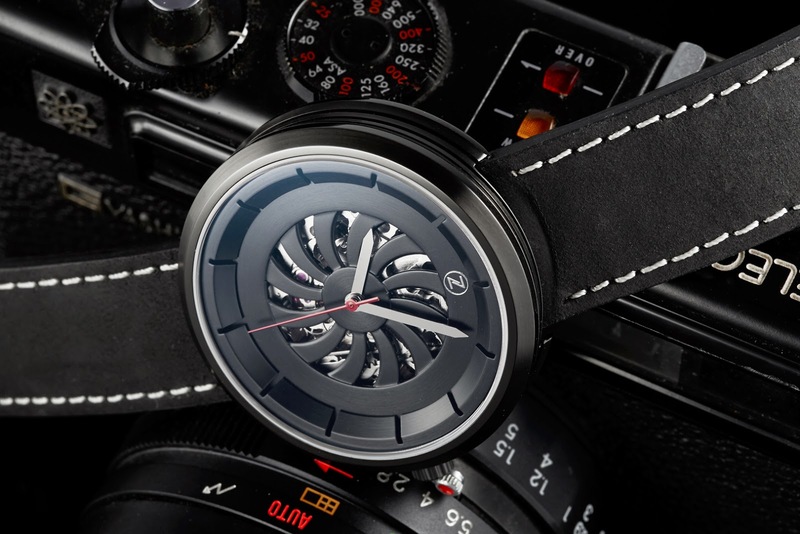 On the first model, the only decoration on the dial is the Zelos logo. The Skeleton, on the other hand, features a cut away dial resembling that of the Perrelet Turbine, offering a glimpse of the mechanical movement inside. 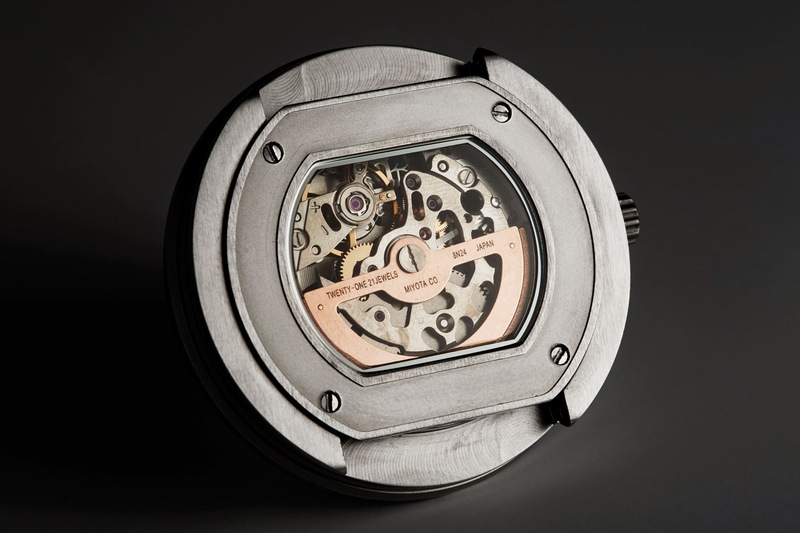 Both versions use the Miyota 8215 and offer a better look through an sapphire exhibition case back. The 8215 is finished, but undecorated save for a rose gold PVD finish on the rotor. It is not fancy, but it is not meant to be. Elshan likens the display as being similar to the glass engine covers on supercars. In similar fashion, the Chroma does not display its movement as jewelry, but as a machine. Name notwithstanding, there is very little color at play. The Chroma will be offered as: Skeleton Steel, Skeleton PVD, Chroma Cream, Chroma PVD w/ rose gold accents, and Chroma Black. As with the Helmsman, Elshan did not ignore the buckle. On the Chroma, cut outs have been machined into the sides, echoing the case design. It is attached to a 20mm crazy horse leather strap with a velvety finish. Each Chroma will be numbered, with only 200 of each variant being produced. The Skeleton model will be limited to 100 of each variant due to the limited supply of movements available. The Chroma will list for $350 CAD, the Skeleton for $450. Pre order pricing starts at $199 CAD (@ $178 USD) and tops out at $299 (@$357 USD) for a Skeleton. A number of stretch goals are planned. Of course, a prototype is only representative of a final watch, things may change in development, and there is no certainty with a crowd funded venture, but Elshan has delivered before. I think the Chroma in both its forms is a clever design with the sort of unexpected, fun details that made the Helmsman so appealing. The early bird price of $178 makes it very tempting indeed. The Kickstarter campaign ends October 29.